I usually don’t post “yay I got this” kinds of posts, but you might actually be interested this year. Especially since a lot of the gifts I got, I picked out myself. Those came from etsy sellers. First, my Dad’s side of the family has a secret Santa gift exchange every year. 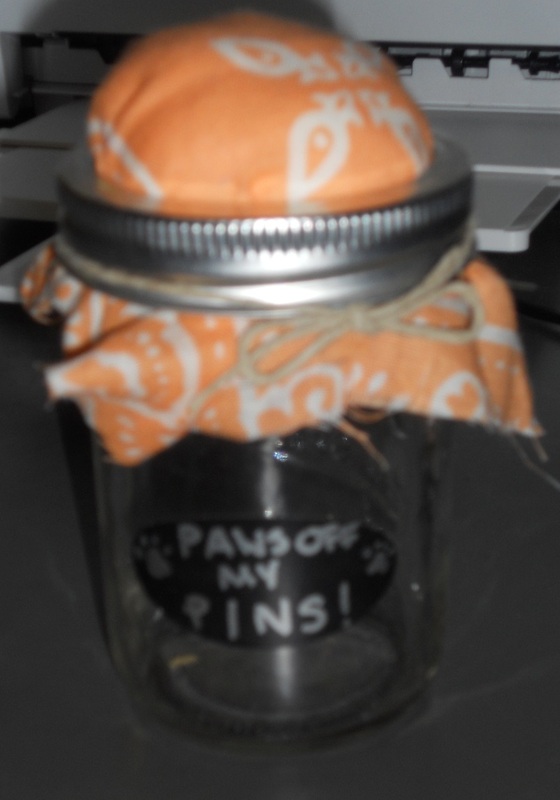 I got a very thoughtful gift this year, a mason jar for pins with a pincushion on top. Oh, and these gifts have to be handmade. It even has a little saying on it with kitty paws. My hubby got me my own printer, which is awesome. Now I don’t have to bug him in his garage workshop to print something out every time I need that. It even has scan and copy features. Woot. I won’t bore you with a photo of that. 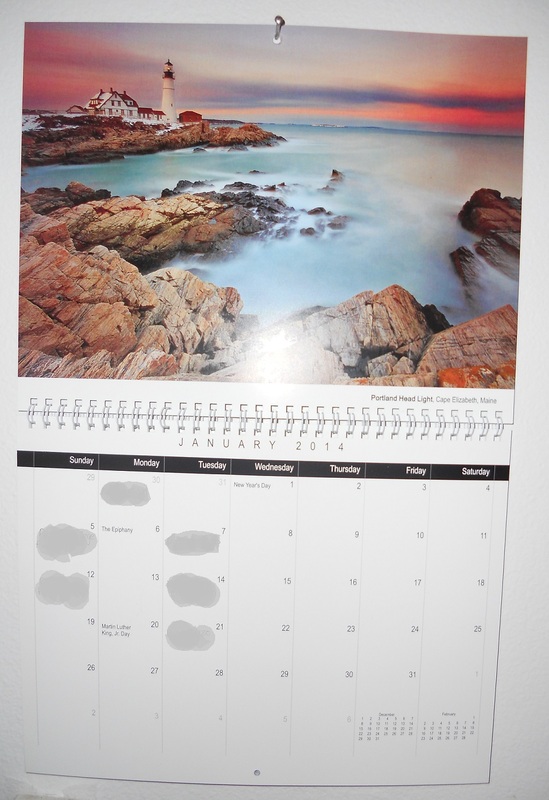 I bought this beautiful photography 2014 calendar from an etsy shop. It didn’t come with those blobs of grey, I added them because I started filling in appointments before photographing it. I also got patterns from two etsy shops. The first pattern is of a messenger bag. Here’s that shop. The second pattern is for up-cycled sweaters and finger-less arm warmers. You can find that kooky shop here. I’m on the hunt things made from wool and cashmere to start making my own up-cycled items. A dear friend has offered me several wool scarves that are moth-eaten. Perfect! I’m looking for items that are stained, stretched, shrunken, ripped, or otherwise unusable to you. Please please contact me if you have anything like that you’d like to donate to my cause. I can help with shipping costs if need be. This entry was posted in Art, Artist's Studio, Custom Work, Inspiration, The Business, Tutorials and tagged art quilts, calendar, cashmere, Christmas, custom portrait quilt, gifts, holidays, mason jar, mason jars, moth-eaten, patterns, paws off, photo quilt, photography, pincushion, presents, quilt, quilter, quilting, quilts, recycling, santa, secret santa, tutorials, upcycle, upcycled sweaters, upcycling, wool on December 29, 2013 by quiltartbymegan.